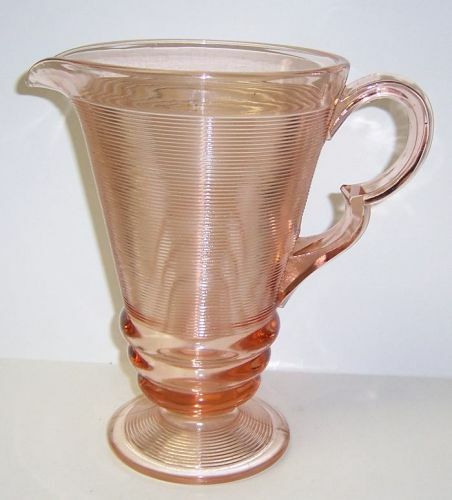 This really pretty depression glass pink Old English Threading 9 1/4 inch high Footed Pitcher was made by Indiana Glass in the Late 1920s. This Pitcher holds 40 ounces. It is in very good condition with no chips, cracks or scratches. This can be a hard pitcher to find. We guarantee items to be as described. THANK YOU. 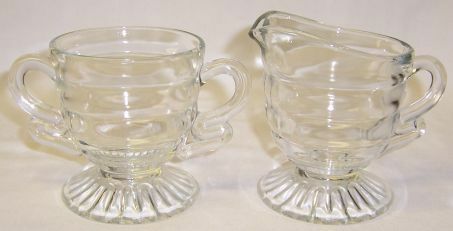 This is a really pretty footed crystal clear Christmas Candy Creamer and Sugar Bowl set made by Indiana Glass. The Creamer measures 3 1/2 inches high. 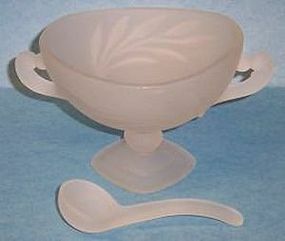 The Sugar Bowl measures 3 1/4 inches high. They are both in very good condition with no chips, cracks or scratches. We guarantee items to be as described. THANK YOU. 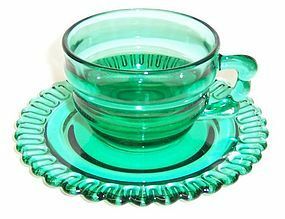 This is a really pretty crystal clear Constellation, aka Pattern Number 300, Cake Plate or Cake Stand made by Indiana Glass, circa 1940. This Cake Stand measures 10 inches in diameter at the top X 7 inches high. It is in very good condition with no chips, cracks or scratches. There is a brandy well in the top center of the cake plate molded in some of the vintage cake plates. We guarantee items to be as described. THANK YOU. 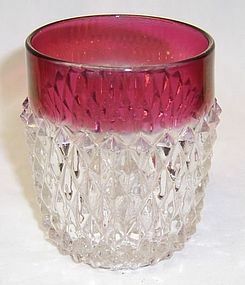 This pretty Ruby Flashed Diamond Point 3 1/2 inch high 9 ounce Flat Water Tumbler was made by Indiana Glass in the 1940s to 1960s. This Tumbler measures 2 7/8 inches in diameter at the top and is in very good condition with no chips or cracks. The ruby flashing is very good. We guarantee items to be as described. Feel free to email any questions. THANK YOU.